How can you teach working with emergent language? One of the three tenets of teaching unplugged that most people agree on is that the language focused on during a language lesson should be (as far as possible) emergent. That is to say, language should not be shipped into the classroom as a starting point for language focus; instead, the actual language being used should be exploited in the first instance, supplemented and strengthened through teacher input at the point of need and during subsequent language work. This raises many questions and issues for those of us involved in teacher training, especially initial teacher training. How can teachers learn the skills necessary in order to work with emergent language? In other words, the ability to identify accurately chunks of language composing your learners’ utterance – as they said it verbatim, not as an accommodating listener may automatically parse it. In other words, the ability to transcribe these utterances in real time and to do this accurately: meaning verbatim. Do I understand what the learner was trying to say? Was the utterance accurate and appropriate? If yes, what features of the utterance permit variation or expansion worthy of study? If no, what do they need to notice in order to repair this utterance and learn from the experience? In other words, the ability to make decisions about how much language to present for exploration, when in the lesson to do this, in what order to do this and in what manner in the class to do this. These compound skills are neither simple nor easy, but many of them are native to human beings and can be subtly and skillfully applied in other domains of our lives (consider our uncanny ability to eavesdrop on conversations on a noisy underground train and recount it later with a high degree of faith to the original, for example). So one thing I would be interested in exploring next Saturday is how these skills and sub-skills of working with emergent language can be taught or developed, both with in-service and pre-service teachers. For me, this question entails both creating and sharing specific tasks and activities, and finding as many ways as possible of arranging them within the framework of a course of training: whether that be a short seminar, or a course of formal state teacher education. 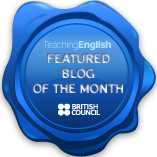 An inspiring example of how this could be done in a short framework with in-service teachers was posted by Stephanie WImmer-Davison on Scott Thornbury’s blog – please do go and read it! The best description of what I do in my classroom I have ever read. My advantage is I never have more than four students – although that makes it even more crucial to exercise all these skills all the time. Small groups really help in lots of ways, but you are right that it intensifies the nature of the work; and 121 is the most intensive of all working environments from this perspective. What “tricks of the trade” have you developed to maintain the “cognitive airspace” you need to focus on the “how” as well as the “what” in your students’ talk? #3 – ask the right questions. I need to think a bit more about this though….